Our Water Features are sure to create an oasis in your garden. The variety of designs and shapes is enormous. Round, square and rectangular shapes are possible. 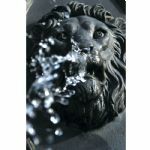 Many of the models can be ordered with a waterfall or fountain and these can also include LED lighting.